Chilean sea bass, also known as the Patagonian toothfish, is a large, white-fleshed fish primarily found in the deep water between Antarctica and the tip of South America. Although it shares the name, this fish does not belong to the bass family and is not the same as sea bass fished in the United States. Chilean sea bass is low in cholesterol and high in protein and omega-3 fatty acids, though it also contains more mercury than smaller types of fish. 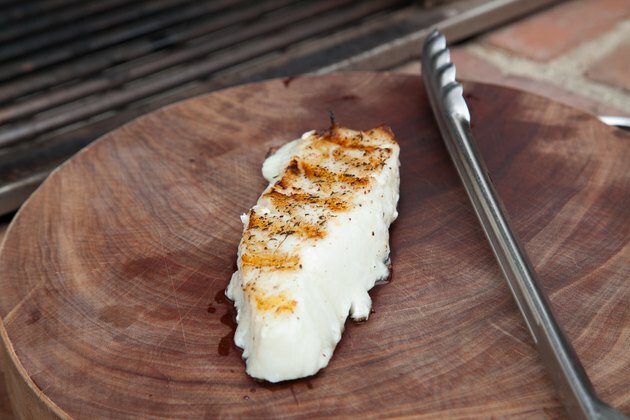 When grilling, you want the Chilean sea bass fillets cooked firm with crisp, seared exteriors. Heat a gas or charcoal grill to medium heat, which is 325 to 375 degrees Fahrenheit. 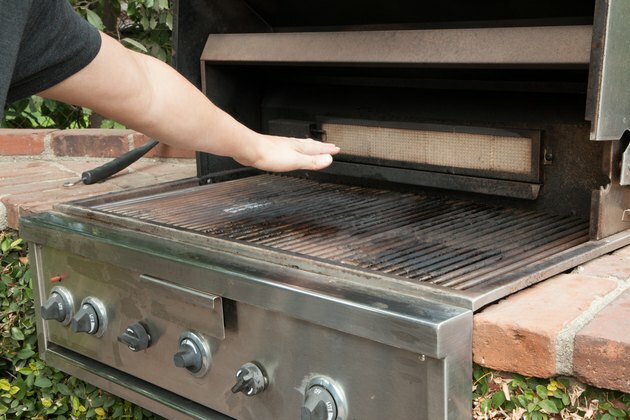 Use a barbecue brush to lightly coat the grate with olive oil. Mix olive oil and seasonings such as lemon juice, salt, pepper, minced garlic, spices and chopped fresh herbs together in a small bowl. 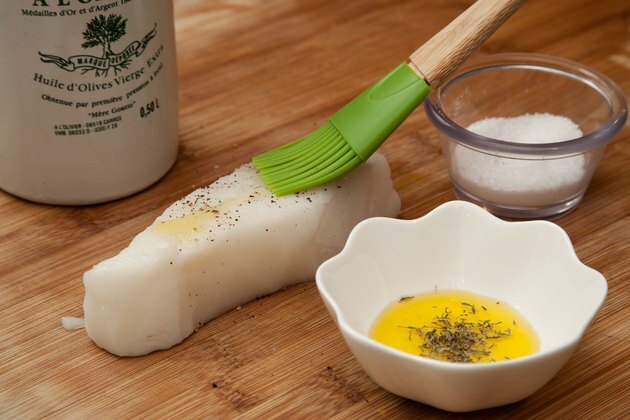 Use a pastry brush to cover all sides of each Chilean sea bass fillet with the mixture. Grill on direct heat until the entire bottom half of each fillet is white and the exterior nicely seared, planning on approximately eight to 10 minutes for a 6-ounce fillet. Turn the fillets over with a metal turner. Grill until the fillets are firm, all the flesh is completely white and both sides are evenly seared. Remove the fish from the grill and serve. 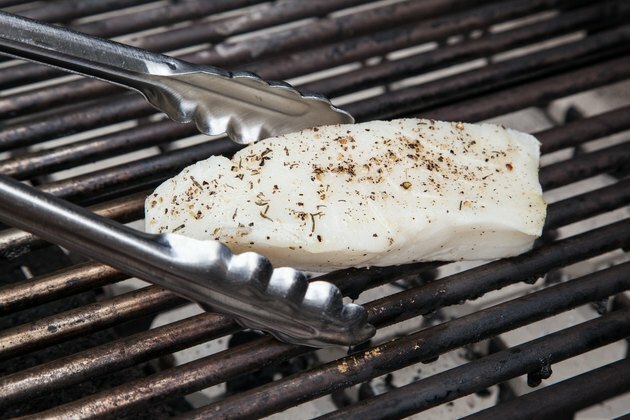 Choose Chilean sea bass fillets that are uniformly 1 1/4 inch thick to ensure even cooking. Whenever possible, purchase Chilean sea bass that was longline caught off the Falkland, Heard, McDonald or Macquarie islands, recommends the Monterey Bay Aquarium Seafood Watch. In these locations, fishing is conducted in an environmentally friendly manner. Do not try to serve Chilean sea bass undercooked. 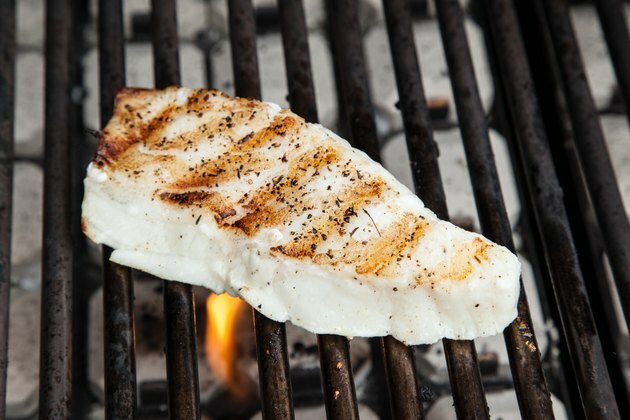 Unlike fish such as tuna, you should grill your Chilean sea bass thoroughly. Chilean sea bass is a high-mercury fish, according to the Natural Resources Defense Council. Pregnant and nursing women, women who plan on becoming pregnant and young children should consume no more than three servings of Chilean sea bass per month.